Slip on the squibomb pet grooming glove and keep your pet's coat looking clean and healthy while reducing the hair scattered about the house! squibomb's pet gloves are BPA free. 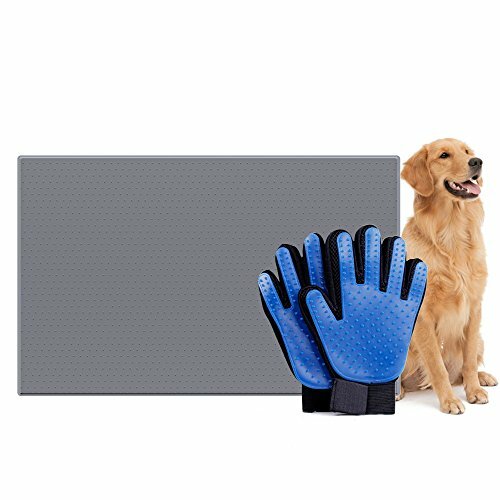 Pet Gloves are made of skin-friendly materials and the surface is soft silicone, which can give you love pet a comfortable massage and will not hurt the skin. The back is made of durable and breathable mesh that it's very comfortable to use the glove. The Velcro strap around the wrist is easy to tighten or loosen for fitting anyone. They are washable and dry fast. They do an excellent job on hair removal from your pet, whether the pet has long or short hair and whether you are using it in dry or wet conditions. This pet food mat's size is very sutiable for all kinds of pet bowls. So it is suitable for all pets. This pet food mat is made from environmental friendly silicone rubber material. This food mat is very convenient to bring when you have outdoor activitied, such as travel, shopping because it can roll up. And it is muti-purpose and it is like a cushion that can make your pets sit down. Anti-slip dot on the mat can keep food bowls from sliding, slipping, and spilling over. This effect is doubled by the lip edge of the mat, which will prevent food bowls being pushed off the mat. Soft, flexible material easy to clean under the sink or with a wet cloth or simply run it through the dishwasher. ★Pet Grooming Glove Upgrade Version - With enhanced 255 silicone grooming tips, mimics the touch of your hand for a soft and relaxing massage; This flexible, slip-on grooming gloves allow you to brush away dirt, dander and loose hair from cats and dogs. ★Pet Food Mat Anti Slip And Keep Clean - The dot on the mat can effectively keep dog bowls from sliding around on the floor. The raised edge (1/8") keeps food and water from spilling onto floor. Keep food and water on the mat. Waterproof, Easy to Clean with water or a wet rag. Silicone mat will not be turnover, will not rust, deform and break. ★What You Get - 2 blue pet gloves (1 left-hand and 1 right-hand; The left hand pet glove is customized for left-handed person. ) and 1 FDA Grade Non-Toxic Silicone Pet Food Mat. If you have any questions about this product by squibomb, contact us by completing and submitting the form below. If you are looking for a specif part number, please include it with your message.